On Wednesday, November 2, our local TV station WSET 13 paid a visit to Desmond T. Doss Christian Academy’s Vice Principal Billy Wright to get his comments for their Desmond Doss interview. Desmond Doss was a long-time member of the Lynchburg Seventh-Day Adventist Church, and the school was renamed in his honor back in the 1980s—long before he became a household name thanks to the movie Hacksaw Ridge by Mel Gibson and starring Andrew Garfield. Our school has been sharing his inspiring story of faith with our students for years, and we are so excited that so many others can now hear about Doss’ faith and valor, in spite of constantly being under fire, not only from the enemy but also from his fellow soldiers who mocked him for being a conscientious objector. LYNCHBURG, Va. (WSET) — Hollywood’s rendition of Lynchburg’s very own war hero Desmond Doss hits theaters Friday. Doss is known as the conscientious objector who refused to kill anyone even in battle. But he also saved many lives. The story of Doss is one of bravery, courage, and the ability to stand for what you believe in and it all started here in Lynchburg. Friday, the story of Desmond T. Doss, known by many as the unlikely hero, will roll out in theaters nationwide. 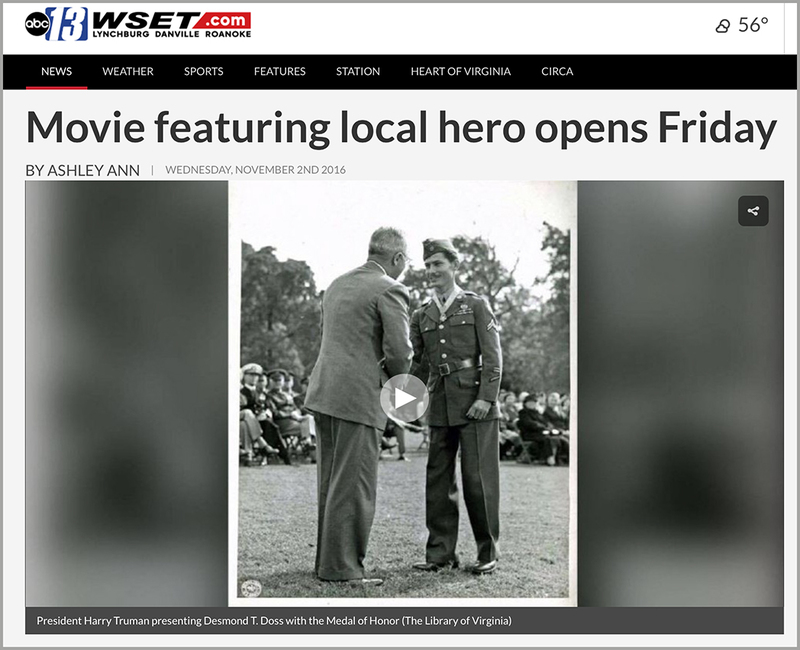 With A-list stars and Mel Gibson directing, moviegoers will learn of Lynchburg born and raised Doss and his heroic acts in World War Two. “Desmond Doss did an extraordinary thing,” said Charles Olson, a board member of the Lynchburg Area Veterans Council. Doss joined the army as a private first class but because of his religion he refused to even touch a gun. He was labeled a conscientious objector – a name he didn’t care for because he wasn’t against the war, just the act of killing. It was 1945 in Okinawa surrounded by heavy gunfire when Doss helped rescue at least 75 fallen men. Some of them he even carried himself into friendly hands. For that he received the medal of honor. “So to see this story now going out the way he would like for it to with an emphasis on God behind the story and not him so much is very it’s fulfilling,” added Wright. Now, most of the movie, Hacksaw Ridge, was filmed in Australia near Mel Gibson’s home of New South Wales. So, they recreated Lynchburg as it would’ve looked back in the 40s to shoot certain portions of the film.